Superb opportunity to acquire a stunning mountain lodge dating back to the 1830s with beautiful views towards Switzerland. The original property was built as a hotel in the 1830s and named Beau Sejour. It was the last accommodation on the old road to Mont Blanc. Since then it has been updated and extended on a few occasions and it was once the property of the famous Cartier family. Although habitable, The Lodge is in need of renovation and refurbishment with potential to create a magnificent 6 bedroom mountain home. The Lodge will retain all the original character and features, but could be sympathetically modernised to combine the latest materials and technologies required for 21st century living. Chamonix was one of the first ski and hiking destinations in the world. Now, it is arguably one of the most renowned and prestigious ski areas and the breath taking surroundings are enhanced by the presence of the magnificent and commanding Mont Blanc. The resort is steeped in history, classic sophistication and architecture. One of the most unique features of Chamonix is it's seamless transition from major ski resort for the winter season to the climbing and hiking mecca that it becomes throughout the rest of the year. The summer season is busy and full of life with visitors enjoying al fresco dining and a full social calendar of events. Chamonix is considered to be a resort that has something for everyone. 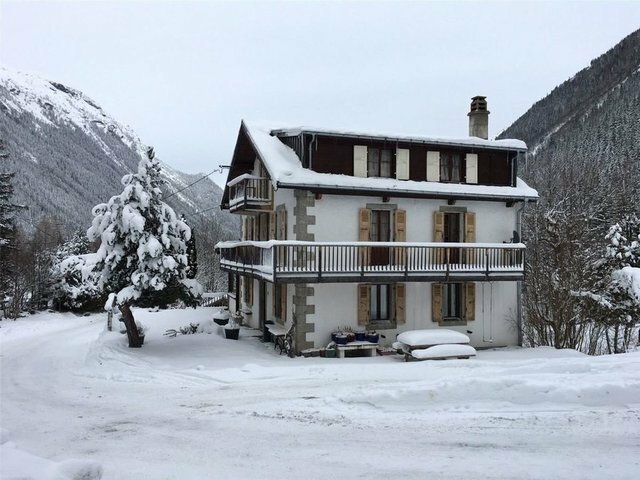 The Lodge is located right next to the Hotel du Jeu de Paume which is nestled between the Aiguilles de Chamonix and the Valley of Argentiere, in the traditional village of Le Lavancher just five minutes from Chamonix. The location offers a true Alpine haven of peace and nature. By Plane: Geneva airport with numerous daily flights from all four London airports and most major UK cities is approximately 88km away. Lyon is 220km and Chambery just 116km. By Rail:There is an SNCF railway station in the resort. Chamonix is also serviced by 'Le Mont Blanc Express' and the TGV. By Road: Chamonix is directly accessible via the Autoroute Blanche (A40) which connects to the European motorway network.